According to the International Survey of Herbicide Resistant Weeds, there are 497 unique cases (site of action x species) of herbicide resistant weeds globally. This organization also has reported that weeds have evolved resistance to 23 of the 26 known herbicide sites of action. Herbicide resistance management strategies must be included in all weed control recommendations. Herbicide resistant weeds are not new for growers in New York State. In fact, we have four officially confirmed herbicide resistant weeds which include common lambsquarter, smooth pigweed, common groundsel and common ragweed all of these cases are resistant to triazine herbicides. Common ragweed was the last herbicide resistant weed case reported back in 1993. This list will soon grow to include at least two, if not, three new herbicide resistant weed cases in NYS. Added to the list will be horseweed (marestail) and tall waterhemp. 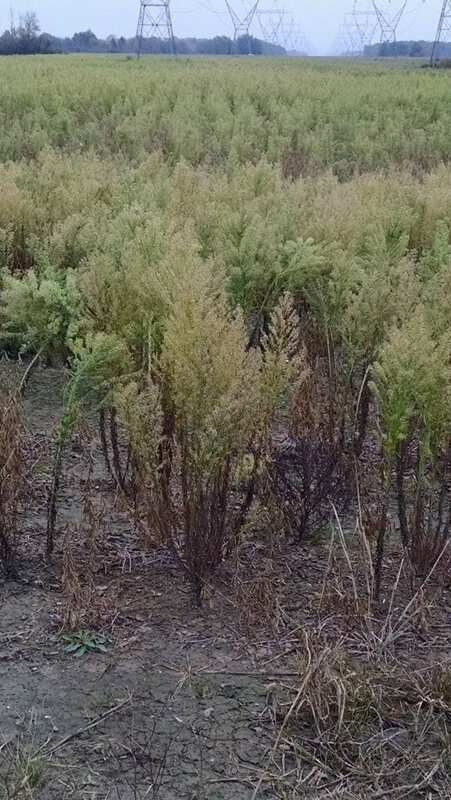 Many growers in Central and Western New York are now dealing with herbicide resistant marestail and a much smaller number of growers are now finding resistant populations of tall waterhemp in their fields. The third suspected herbicide resistant case is the recent discovery of palmer amaranth on a NY farm in October. This is the first report of this weed growing in NYS. For those unfamiliar with palmer amaranth, the Weed Science Society of America ranks it as the most troublesome or difficult to control weed in the United States. Remembering back to pesticide applicator training classes, you may remember the term Mode of Action when herbicides were discussed. The mode of action can be used to describe the process or how the herbicide controls the targeted weed. When we talk about herbicide resistance management we need to think about Site of Action (SOA). The SOA is the location in the plant where the herbicide acts or has its effect on the plant. The SOA is sometimes referred to as the Mechanism of Action. When selecting herbicides to include in the tank mix we must now pay close attention to not only the mode of action, but also the site of action. Resistance management strategies include using herbicides with different sites of action. It is challenging enough to come up with an effective herbicide weed control program and now we are being asked to include herbicide sites of action in the decision making process. Fortunately, there has been a numbering system developed to make this an easier task. There are now herbicide group numbers assigned to each different SOA. The group numbers are found on the first page of almost all herbicide labels that we currently use in field crop production. Multiple numbers in the box indicate the herbicide or herbicide premix has more than one SOA (see example below). When we use herbicides with the same SOA over and over again it fosters the development of herbicide resistant weed populations. To prevent or delay the development of herbicide resistant weeds we must include herbicides with different sites of action in the tank mix. In order for this resistance management strategy to work you must have at least two different SOAs that are effective on the targeted weed. Here are some scenarios that demonstrate how we can best use the herbicide group numbering system when making herbicide application recommendations. Let’s examine a no-till soybean burndown program for control of multiple resistant marestail (glyphosate and ALS resistant (or Group 9 and 2)) using a tank mix of glyphosate (group 9) + Valor XLT (a premix of Classic (group 2) + Valor (group 14)) + 2, 4-D LVE (group 4). This herbicide program contains herbicides with 4 different SOAs, a group 9, 14, 2, 4. The marestail in our example is resistant to both group 9 and 2 so these products will do nothing to control the marestail; however, the Valor (group 14) component in Valor XLT and 2,4-D LVE (group 4) will provide two different effective SOAs on our targeted weed, multiple resistant marestail. Here is another example using glyphosate resistant (GR) tall waterhemp in Roundup Ready soybeans. A Flexstar GT (a premix of Flexstar (group 14) + glyphosate (group 9)) application applied postemergence to soybeans for the control of emerged GR tall waterhemp will provide control. It will provide control of GR resistant waterhemp because the Flexstar (group 14) in the Flexstar GT is providing the control. However, from a resistance management strategy this may not be the best program because the only effective SOA in this program is from the Flexstar component. This will put greater selection pressure on our population of tall waterhemp and it could eventually become resistant to the Group 14 herbicides. To improve this program you could elect to apply a soil applied herbicide preemergence such as Dual II Magnum, Outlook or Warrant (all group 15 herbicides) followed by a postemergent application of Flexstar GT. This will provide two different SOAs (Group 15 and 14) that are effective on our targeted weed, GR tall waterhemp. Utilizing effective herbicide resistant management strategies goes beyond just using herbicides with different effective sites of action. This is just one part of the resistance management puzzle that we need to piece together so that we can delay the development of resistant weeds from showing up on our farms. Herbicide names used in this article are for illustrative purposes only and do not constitute and endorsement of the product.